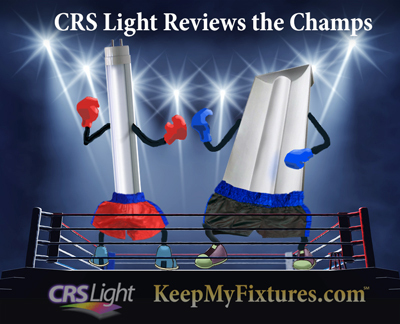 CRS has been providing color-correct light since 1999. I started with one of the champs in the color-correct arena, the True Lite fluorescent. The bulb will no longer be manufactured, however, the light gave us an excellent standard to shoot for. Specific color-correct LED’s now test out extremely well, however, each light has its pros and cons. Once you know these, you’ll know which way to go to keep in great light. I’ve put together a comparison table below with the features that are most important to my clients. For example, if I’m inspecting high gloss or high-key pastel coloring, then the glare factor is very important. If I’m making a presentation and I need an emotional factor or an enhanced color look, the lighting can help animate color. Room brightness or subtle color are also factors. There is a measure of subjective visual perception when comparing features. I have an art and design degree with 35 years of experience. Another vision expert’s opinion could differ as beauty is indeed in the eye of the beholder. Your decision window with color correct fluorescent is closing fast—or just may be closed already! Another thing to consider is the length of time you are planning to stay at your location. If it’s under two years it may not be worth the expense of LED and fixture conversion. If it’s over two years, LED is a strong consideration if it meets your vision requirements. Your productivity or reputation doesn’t need to be on the line because of a poor color match or a missed detail. If you are doing three or more large offices, it may be worth contacting your energy company to see if they are offering any cash incentives for LED upgrades. I have run calculations where clients would receive 15-25% back on their conversion job. When regular T5’s are swapped out for T5 LED’s, they can receive 75% back. An advantage of LED’s is they concentrate their light via beam angle and some have a higher lumen output. This means your fixtures may only need half the LED light tubes. The energy company’s incentives shoot up when you find areas that don’t need to be running all the lamps a fixture was built for. Storage areas, closets, and low use halls are excellent areas for this. Vision fans should consider light as a benchmark for consistent quality that works together with other important factors that contribute to the end result of judging your workpiece, tooth, skin and hair color, or paint or finish match-up. If others are involved in your process, they should also be under the same color quality light. Please feel free to contact me at any time to help walk you through your lighting update process. I can be reached at 888-572-3899. Accuracy, Kelvin/CRI All you’ll ever want to know about light to light differentiation can be found at: http://www.crslight.com/lightingcharts.htm. A “10” rating is my top rating in the artificial light world. Animate: This light quality feature captures the extremely subtle differences in the hue of pastels. Variables include the lights ability to penetrate translucent color layers all the way down to a base layer, then reflect back the “real” color. The light’s ability to create vibrancy to color. A “10” rating is my top rating in the artificial light world. Ambience: Provides a soothing, white-light environment while still maintaining a cheery atmosphere. Vision comfort. A “10” rating is my top rating. ** Glare: How much light or glare is reflected on your work surface. This is important in seeing color when you have shiny or wet surfaces and you need to see subtle color differences. A “0” rating is my top glare rating in reflective light. Life/Hours: The average life of a bulb. Fluorescents should be changed out every 3-4 years for optimum seeing. An LED can go 8-11 years depending on specific daily usage, steady current, dust levels, usage temperature. A side note: LED’s maintain their brightness in chilled weather where fluorescents loose brightness. Cost Comparison: Based on a small size order, a price difference would look close to this. Even though a 4,’ T8 fluorescent light tube cost close to $10 a tube, you can use this base price to give some sort of a cost comparison. Energy Usage: This is the watts used per lamp. When a fixture utilizes a ballast, the ballast, on average, will use 7 watts per two lamps used. Ballasts also need to be replaced and create heat, which in warmer climates will increase your cooling costs. The new LED’s can be used with or without ballasts, giving you the choice of a quick rewire, or just popping in the bulbs. Fixture Conversion Required: Most fixtures in place are usually in relatively good shape. Along with a bulb change-out, the lens covers just need to be wiped down or replaced, this usually happens a few at a time. New construction is a different story. Prewired for LED fixtures are now available along with LED troffers, panel lights, etc. The best way to explain a fixture conversion is to visit this link and scroll down to the bottom of the page for a schematic. Note this is an un-shunted receptacle application. Our LED “Contender 3” works in several wiring schematics with and without ballast scenarios for easy and convenient conversions. Contender 4 needs a direct wire hook-up using an un-shunted receptacle. * The True Lite fluorescent light will no longer be manufactured. The existing inventory will be sold up until March 15, 2018.